Throughout this trip, I was pretty adventurous concerning trying new foods. While escargot wasn’t on my list of things to try in France, I did not turn down the opportunity to sample it at Le Relais Gascon. 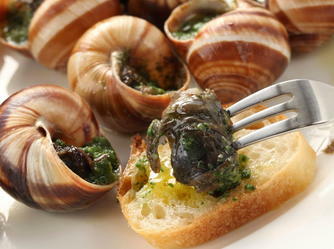 Posted below is an Escargot recipe (4 servings) for my brave viewers! For the escargots: Melt the butter in a saute pan over low heat and add the shallots, snails and garlic. Slowly saute for 10 minutes. Season with salt and pepper, and then stir in the parsley. Set aside and let cool. For the garlic and parsley butter: Mix together the butter, sea salt, pepper, parsley, garlic and tarragon in a blender until very smooth. Season with more salt and pepper, if needed. Place 1 snail in each hole of the gratin dishes, and then cover with garlic and parsley butter up to the brim. Top each snail with a fine brioche crouton. Bake until the butter is bubbling and the croutons are golden brown, about 7 minutes. Serve and enjoy!